Those who followed my blog last year saw me work at tracking and isolating the various likely factors responsible for the temperature variation experienced throughout the ten thousand year Holocene. A big question mark was the existence of a two thousand year or more Bronze Age optimum that ended with the Hekla event in 1159BCE. We ran down a lot of factors and in fairness none appeared up to the task of explaining that particular optimum. Since then, the climate has precipitously cooled and then warmed slowly over decades approaching the former optimum but actually coming nowhere close. The Rhine has been frozen several times throughout history and each time local climate took a long time to recover. Yesterday’s item finally provides a creditable mechanism to operate this engine. We have a layer of freshened water that is between one to two hundred meters thick lying on top of the underlying ocean waters. The temperature of these underlying waters is about two degrees over the freezing point of fresh water ice. That is a huge supply of available heat that if actually mixed with the overlying ice would eliminate it. The upper layer is a degree or so below the freezing point. This means that a sustained warm spell and plenty of help from winds could remove this layer. If this layer is removed, it becomes decidedly harder for sea ice to form at all and its breakup the next summer will simply put it back to the way it was. With surface temperatures a couple of degrees above freezing during the summer, the land will warm up and as happened during the Bronze Age, the permafrost will disappear. 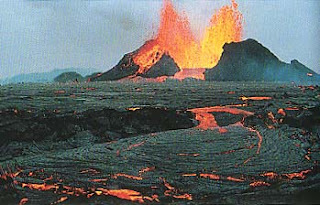 It is pretty obvious that the Hekla event gave twenty years without crops and that means the gain of at least a couple of meters of sea ice each of those years. Over twenty years that likely added up to a beginning round of forty meters. The process likely continued at a slower pace for centuries longer until the sea ice approached a thickness of even a hundred meters or more. What happens with sea ice is that as it ages the salt is slowly removed and this salt mixes into the surrounding ocean were normal circulation takes it eventually out into the Atlantic. Thus the post Bronze Age cold spell produced a fresh water layer sitting directly on top of the polar sea. The lack of severe storms failed to produce any mixing since it was way too thick anyway. The present situation and some fortuitous winds appear to have thinned this layer and have led to the present gross reduction in sea ice thickness. I do not think that the remaining sea ice is any more than part of a two year cycle of ice passing through the gyre and if not that yet, is about to be. The big question now is whether the winds or normal seasonal warming, sufficient to remove this fresh water cap anytime soon. We are at the point in which it can do a lot of good. Yet I am aware we have been here before for decades even only to have it abruptly end. And that mechanism is now a little clearer. For some reason we get a summer or two without any melting and suddenly we have a lot of ice. One Alaskan Volcano could do that. It really is that quick. If this mass of left over freshened water from Hekla could be eliminated though, we could return to Bronze Age conditions.